•Foshan Chancheng Water Town Construction Development Co., Ltd. The site is located in the western part of Foshan’s downtown and on both banks of Dongping River. 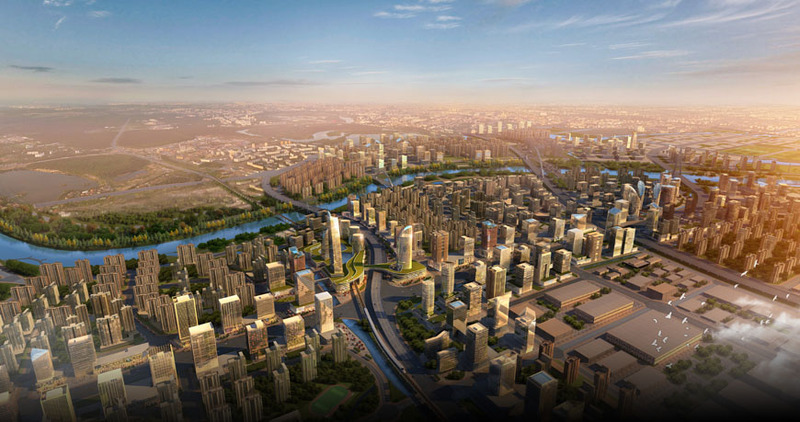 The two major site neighborhoods are named “Zhangcha” and “Nanzhuang” and are connected to the commercially vibrant city of Guanhzhou by the Guangzhou-Foshan Lightrail. At this time, our site in Foshan is commercially underdeveloped, and we would like exploit its Guangzhou transportation links to create a new industrial ribbon to attract new enterprises. 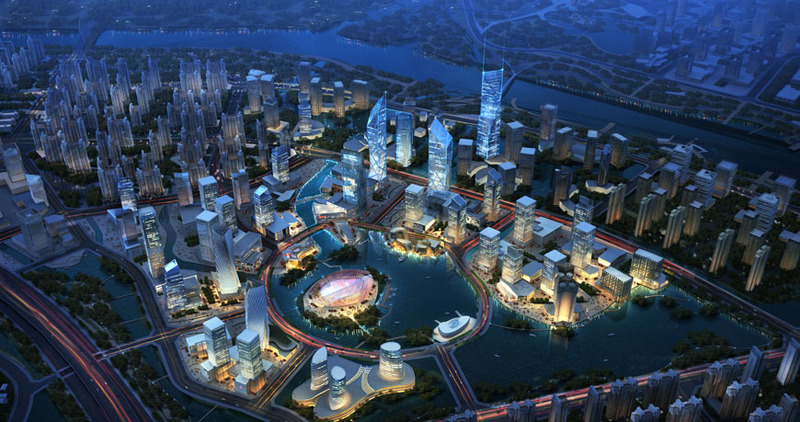 Coordinate our development strategy with Foshan old town, new town and Qiandenghu new town. Our new city center is to contain traditional industry, new industry, support services, residences, tourism, new transportation links, and major green belt and riverside development. One Heart: The development engine, or heart, of this project is the multi-layered Zhangcha city transportation hub. One Jing: Jihua Road, Chanxi Avenue and Zidong Avenue form the “Jing” shape of overlapping service and industry development axes. To complete the four pronged Jing geometry, it contains commercial services, traditional manufacturing, high-tech manufacturing and high tech industry. Left bank: high-end comprehensive service zone; includes administration, service, culture, innovation, residential, and tourism facilities. Right bank: new industry cluster district; includes innovation and R&D, service and residence, culture and tourism. 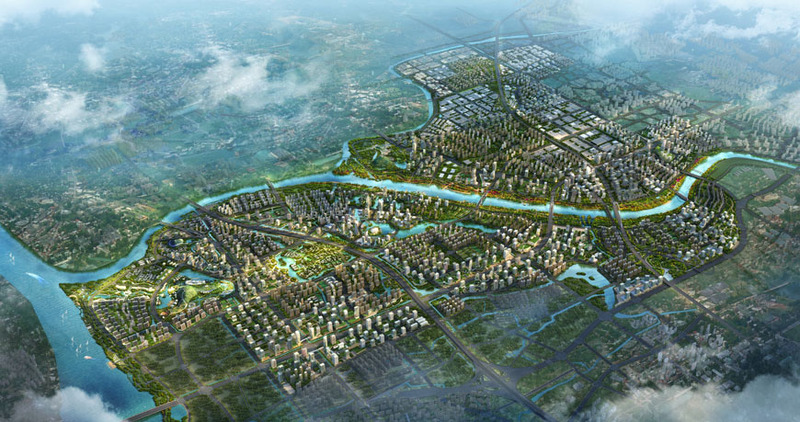 Divide the riverbank into eight functional areas such as a wetland hotel zone, a business zone, etc. Also create major riverbank-waterfront public areas. Gangbeigang Hillock, Huchong Villige, Lvdao Lake and Wangjiegang Hillock reflect the history and culture of the region. We are also proposing a cultural-touristic ribbon paralleling subway line #4. The “ribbon” is to feature a lifestyle commercial complex, traditional Lingnan village, city service centers, nature culture tourism, subway related commercial, village and waterfront lines, and more. This corridor is to become a cultural landmark, reflecting the past and pointing towards the future.